Your vehicle’s lighting system is an integral part of vehicle safety and requires regular maintenance. You’ll know it’s time to take action when you notice a bulb has gone out, or when your vehicle’s external lights are no longer as bright as they once were. Whatever the issue is, Jiffy Lube® is here to help! There are many lights within your vehicle’s lighting system that you depend on to provide clear visibility and communicate with other drivers on the road. As such, it’s important that issues with your vehicle’s lights are recognized and remedied quickly and effectively by a trained technician. 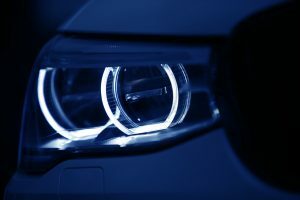 Due to the vast amount of light bulb types and brands there are on the market, changing your vehicle’s exterior lights is far more complex than you may think. It may seem easy to do it yourself, but not having the proper tools and experience can be costly – drive into your local Jiffy Lube® today to have your vehicle light issue quickly diagnosed and replaced by one of our qualified technicians! Headlights are located at the front of your vehicle and are integral in improving your visibility on the road. Headlights have two settings, low beams and high beams. Low beams are directed slightly downward and provide a good amount of light without blinding other drivers. Low Beams are also used during the daytime as daytime running lights, and in most modern vehicles these will come on automatically when the key is turned in the ignition. If your vehicle is not equipped with this feature, it’s good practice to manually turn your headlights on for daytime driving safety. High beams, on the other hand, are extremely bright and are centred straight; providing a greater amount of light than low beams. 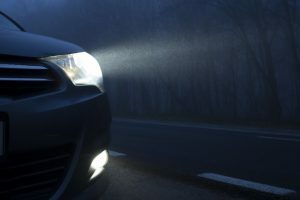 Because high beams can be blinding to other drivers, they should only be used when there are not a lot of cars around and when you are driving on poorly-lit roads at night. These are the amber lights that highlight the four corners of your vehicle for added visibility. They will always be on while your headlights are on, and should also be monitored regularly for burnt out bulbs. Like your vehicle’s headlights, your tail lights help improve the overall visibility of your vehicle to other drivers. Tail lights are the red lights located at the rear of your vehicle and are activated when your headlights are turned on. While your vehicle may have automatic daytime running lights, not all vehicles feature automatic night time lighting, including tail lights. It’s important to understand how your specific vehicles lighting system operates, to ensure you have tail lights during conditions of low visibility such as night time or in heavy rain or snow. Your brake lights are also located at the rear of your vehicle and are designed to light up automatically when you use your brakes. As such, these lights are critical to the safety of others as it signals to the drivers behind you that you are slowing down or are coming to a complete stop. Fog lights are located both in the front and the rear of most modern vehicles. Fog lights are completely separate from headlights and are turned on manually to improve your visibility in foggy conditions. Note: because fog lights have an intense beam of light, it’s important that they are only turned on when necessary. Your signal lights are located at both the front and rear ends of your vehicle and communicate to other drivers (by blinking) when you are intending to make a turn or change lanes. As a result, signal lights are one of the most important safety features on your vehicle and, like other vehicle lights, should be replaced immediately when they are no longer working. Hazard lights are also located at the front and rear ends of your vehicle. Once turned on, the lights will flash and signal to others on the road that you are experiencing an issue and they should proceed with caution while driving around you. Jiffy Lube’s knowledgeable technicians are qualified to replace many different types of vehicle lights and get you on your way in a jiffy! Dim or Burnt Out Headlights? 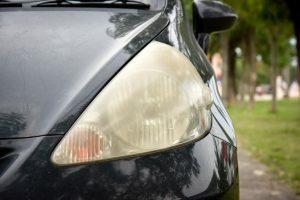 If you notice the brightness of your vehicle’s headlights have diminished, your headlight’s lenses may need to be restored to their original clarity. If you notice a bulb on your vehicles is burnt out, it should be replaced immediately for the safety of you and everyone on the road. If you have any questions about your headlights, a Jiffy Lube® technician can perform a vehicle light inspection to determine the right course of action. If you see that one or a few of your vehicle’s exterior lights are out, the bulbs should be replaced immediately. The type of lightbulb your vehicle needs depends on your vehicle make and model. Two of the most well-known types of vehicle light bulbs are Halogen and LED. Halogen bulbs are the most popular type of headlight bulb in vehicles and are also the cheapest on the market. Halogen bulbs are made out of tungsten filament and a small amount of halogen gas. When turning on a halogen bulb, the current that passes through the filament gets white hot and emits light. This is why vehicles that use halogen bulbs are often hot to the touch. On the other hand, LED bulbs are relatively new in the automotive industry and are known for producing a very white light. Manufacturers tend to opt for LED over Halogen bulbs now due to the fact that they are far more efficient since they require a significantly lower amount of wattage. 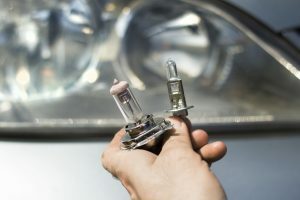 If you’re unsure which type of light bulb is right for your vehicle, one of our qualified Jiffy Lube® technicians can help you choose the correct bulb type based on your vehicle’s make and model. Vehicle headlight lenses are made of plastic which deteriorates to varying degrees over time from the sun’s UV rays. This oxidation creates a cloudy film over the headlight lens resulting in reduced brightness and visibility. 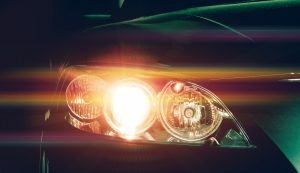 Once your vehicle’s lighting issue is properly diagnosed, a Jiffy Lube® technician can restore your headlight lenses to their original lustre in just minutes – no appointment! Why Get Your Vehicle’s Lights Restored or Replaced at Jiffy Lube®? Due to the vast amount of light bulb types on the market, changing your vehicle’s exterior lights is far more complex than you may think. If you end up choosing the wrong light bulb it could end up costing you significantly in repairs. For example, it’s easy for small plastic pieces on the lights to break – especially if you don’t have the proper tools. 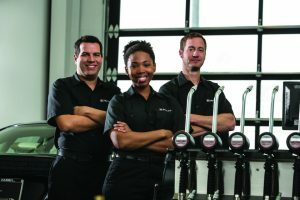 Our trained technicians have the tools and experience to solve your problem in a Jiffy! Save yourself the hassle and drive into your local Jiffy Lube® today to have your vehicle light issue quickly diagnosed and replaced by one of our qualified technicians! Did you know? Vehicle lighting checks are part of every Signature Service Oil Change at Jiffy Lube®. Plus, we’re always happy to provide a FREE lighting check any time upon request. Visit your local Jiffy Lube® today!